This blog has been created to help everyone understand the importance of hair care and how to achieve the best results possible using our hair products as well as any others. We will feature sections on basic hair care, natural hair care recipes/remedies and hair styling. Our main aim is to educate and inform through online interaction. It is our belief that anyone regardless of nationality, genetics, hair type etc can achieve longer, healthier hair. Hello my loves, I am back again with another post – let’s get started. Castor Oil has been used throughout the centuries as a remedy to prevent hair loss and thinning hair. It is derived from the seeds/beans of the Castor Oil plant. Castor Oil is actually one of the most effective oils for hair growth, this is because it contains proteins, minerals, Vitamin E as well as omega 6 fatty acids. It also has natural anti bacterial and anti fungal properties which combat dandruff and other scalp infections. Castor Oil contains ricinoleic acid (Omega 9 fatty acids) which boosts hair growth and thickens the hair thereby giving it a fuller appearance. Castor Oil penetrates deep into the hair shaft and provides nourishment to the hair follicles and shaft. Its protein content aids in the prevention of keratin loss thereby strengthening and fortifying the hair against damage from external factors. Castor Oil is also a humectant as it draws and retains moisture from the atmosphere into the hair. When buying castor oil it is important to determine how the oil is made; it must be cold pressed (which means the ingredients natural value has been retained) and unrefined to be authentic. There is the regular castor oil and then there is black castor oil which goes thorough a slightly different processing method (where the beans are roasted). However in my own opinion both types work the same. Personally, castor oil is one of my favourite oils and features as a key ingredient in my Wura’s Secret Hair Care Products. The reason why I like this oil is because it feels soft when I apply it to my coarse textured hair. It penetrates deeply into my hair shaft and conditions and moisturises it; as castor oil has the ability to not only coat the hair shaft but to penetrate deeply into it, thereby nourishing and hydrating the hair. I also love castor oil because it thickens up the hair and promotes and aids faster hair growth. If you are therefore looking for your hair to derive the above benefits, I would suggest that you in addition to using castor oil on its own, also try to make sure that castor oil features as an ingredient in the hair products you use. As a Scalp/Edges Oil: This is one of the most popular ways to use castor oil. It simply involves applying castor oil to your scalp and also on your edges. It is important to massage as you apply to obtain the maximum benefit from the oil. As a Pre-shampoo Treatment: Castor Oil can be used as an effective pre shampoo treatment simply apply it to your entire hair as well as your scalp and cover hair with a plastic cap leave on your hair for at least 30 minutes (you can even leave it in overnight for optimum benefits) before proceeding to shampoo your hair. As a Deep Conditioner/Deep Conditioner Addition: You can use castor oil alone to deep condition your hair; you can also mix it with other oils such as sesame oil and sweet almond oil. Start with slightly damp hair, apply the oil to your hair and scalp, cover hair with a plastic cap and apply some form of external heat for deeper penetration for about 20 minutes or longer for maximum effect. Castor Oil can also be added to your deep conditioning treatments. 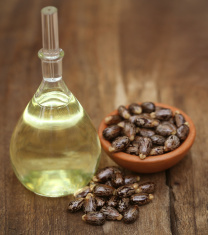 As a Hot Oil Treatment: You can use castor oil on its own or in addition to other oils for your hot oil treatment. Simply heat the oil gently (this can be done by putting the oil in a pot of hot water for about a minute) and then apply on your hair and scalp. Cover with a plastic cap for at least 20 minutes or longer for maximum effect. As a Sealant: Castor Oil is an excellent sealant because it is a thicker oil which ensures that the hair stays moisturised. Simply use your moisturiser of choice and seal with castor oil. Thank you all for reading my post on Castor Oil for hair growth. If you have any experience with using castor oil, please share or if there is any topic you want me to address on the blog, kindly share as well. "only by the grace of God are we led and drawn to God. It is his grace that conquers a multitude of flaws and in that grace, there is only favour. Favour is not achieved; favour is received" - C. JoyBell C.
Castor oil was what saved my edges!! same here! It's a forever fave. I love the blog post. Feel free to post summaries of your blog posts on the CITYTIMES. Very soon you would be able to sell hair products on our platforms.